A wild-looking cat that might, to the imagination, have just walked out of an ancient forest, the Somali is a longhaired version of the Abyssinian. The fur is lush and slightly shaggy, without any tendency to woolliness. 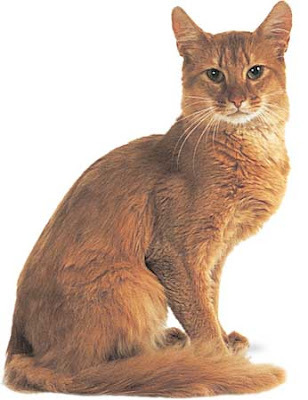 Whereas Abyssinian coat hairs have two to three bands of color that form the ticking, the longer Somali hairs carry ten or even more, giving a very rich color density. The longhaired gene may have been introduced into Abyssinian lines during the 1930s, or even before, but Somalis were not systematically developed by North American breeders until the 1960s. A breed club was founded in 1972, and by 1978 the Somali was recognizes by all American governing bodies. The breed is now widely distributed throughout Europe and is particularly successful in Australia, where Somalis are bred almost to the exclusion of Abyssinians. Somalis are highly intelligent, good-tempered, and playful. They may be slightly more shy than Abyssinians, but are similarly unsuited to a life spent entirely indoors. The two most commonly seen varieties are the Usual, or Ruddy, which has a golden-brown coat, ticked with darker brown or black, and the Sorrel, or Red, which has a warm copper coat ticked with chocolate. A recent addition to the show bench is the Silver Sorrel, which, according to the preliminary standard, should have a sorrel topcoat and a pale undercoat. A very new, and still unusual, variety, the Silver Sorrel has already attracted must attention. A moderate wedge-shape with a medium-size nose. Pink nose pad. Large and almond-shaped. Color can be amber, hazel, or green. Dark lid-skin and hazel-colored eyes. Large, set well apart, and pointed. Ears tufts. An Oriental type, medium in length and elegant; slightly larger than an Abyssinian, and not as fine-boned as a Siamese. Fur is medium-long, dense, silky, and fine-textured. The undercoat should be pale, ticked with chocolate, to give a silvery-peach effect. Coat is non-matting. Coat is longer on stomach. Long, thick at the base, and slightly tapering. Tail should have full brush. Long and slender. Chocolate ticking should extend up back legs. The paws are small and oval with pads that should be pink. Toe tufts. Like all varieties of Somali, the Silver Sorrel’s coat may take up to two years to develop its mature, ticked appearance. The body color of the Sorrel, or Red, should be as deep as possible, with chocolate brown ticking. Also known as a Ruddy, this variety has a rich golden-brown coat ticked with black. Darker shading should form a line along the spine and tail, which ends in a black tip. The two short, vertical lines above each eye are a characteristic feature.